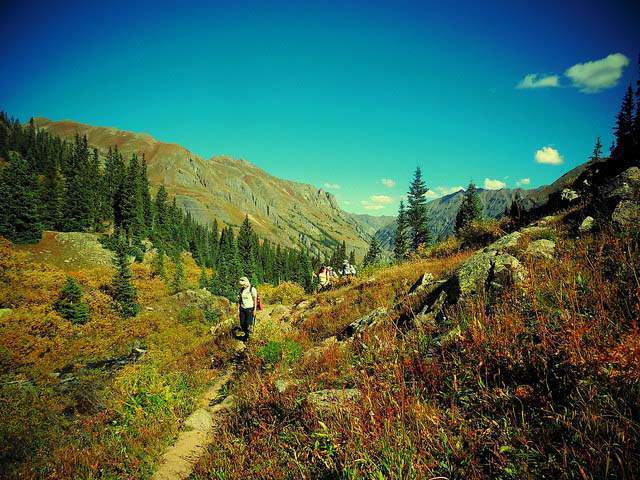 Hikers enjoy a geology walk last September at Highland Mary Lakes near Silverton. Family Backpacking at Purgatory Flats, May 30-31. Families with kids ages 7 and older – what a great opportunity to backpack with a naturalist and certified interpretive guide. Some equipment may be available to rent for free. Contact MK Thompson to sign up at 385-1288. Kids ages 12–16 (parents not required) can come to the Backpacking Trip on July 27-29. Contact Thompson to sign up or for details (see contact information above). Get to Know Mud Springs on National Trails Day – June 6. Mud Springs is a Special Recreation Management Area near Cortez. Come hike or horseback ride for the morning – specialists and naturalists will be on hand to answer questions and lead hikes. Contact Kathe for more information at 385-1310. Purgatory Nature Walks – Tuesdays and Thursdays, from June 9 to Aug. 13, SJMA is, again, offering free nature walks at Purg. We have amazing, knowledgeable, super-nice volunteers who will take you up on the chairlift and hike around at the top with you while pointing out mountain peaks, wildflowers, animal tracks and more. Meet them at 9:45 a.m. at the Purg ticket office so the group is ready to go by 10 a.m. The program ends around 12 or 12:30 p.m. Thanks to Purgatory for providing free lift tickets for this great program. Our cultural program director, Ruth Lambert, will be leading one of our very popular arborglyph walks June 27 at Moonlick Park near Bayfield. You don’t want to miss the canoe trip Aug. 12-16 on the Green River. Dr. Andrew Gulliford will share western history, and Thompson will be your naturalist guide on this amazing trip. Sign up at centennialcanoe.com. A few other dates to set aside this summer are below. Make sure to check www.sjma.org for more information, and email kathe@sjma.org to sign up for SJMA e-news. June 2 – Purgatory Naturalist Training – come volunteer for this great program. June 18 – Family hike at a Bluebird Trail and Alpaca Farm near Dolores. June 11-13 – Ghost Rider training, Pagosa Springs. July 16 – All About Hummingbirds, near Dolores. July 25 – Butterflies & Blooms family hike, near Durango. August 20 – SJMA Volunteer/Membership picnic, Junction Creek Campground. August 25 – Edible Plant Walk, Durango. Sept. 19 – Backcountry Experience Chili Chase Fundraiser for SJMA, Durango. Sept. 26 – National Public Lands Day, Phil’s World work day, Cortez.